One might ask, “Buddy who?” But the crowd I sat with recently at the opening transfer from the downtown production of “Buddy~ The Buddy Holly Story” to New Village Arts Theatre in Carlsbad, all knew. Just watching their bobbing heads and tapping feet told me that I was in the right place at the right time. Buddy Holly would have been one year older than yours truly had he not taken that ill fated plane hop from Cedar Lake, Iowa to a concert in Moorhead, Minnesota. The weather was so bad he didn’t feel like taking the bus. Holly was 22 at the time and left behind a pregnant wife, a cache of unsung, unwritten and unproduced tunes and a generation of adoring fans. On board were his pals and originals in their own right Ritchie “La Bamba” Valens, who was only 17 (an excellent Shaun Tuazon) and The Big “Chantilly Lace” Bopper (a hoot ‘n howl Manny Fernandes). From “Peggy Sue” to “That’s All Right”, to “Teenager in Love”, “Maybe Baby” and “Not Fade Away” he was a rebel with a cause. He wanted to write his own music to the beat he heard, not someone else’s. His journey is chronicled in Alan James’ “Buddy The Buddy Holly Story”. This year’s “Buddy The Buddy Holly Story” originally opened downtown at the Horton Grand under the direction of Christy Yael Cox and was from the start a two for one theatre treat in that after the run downtown it would then transfer to Carlsbad at the New Village Theatre. What a great sharing. 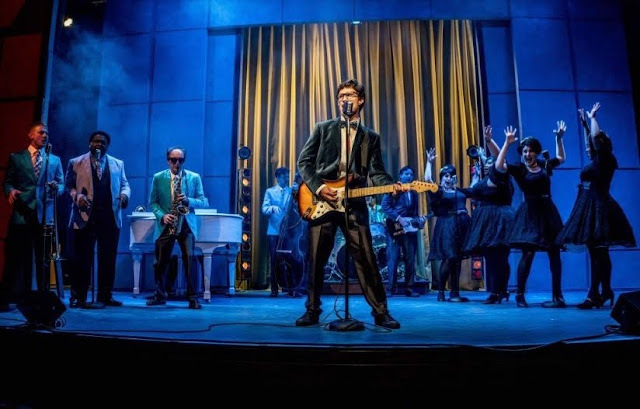 Thanks to Christy Yael-Cox co-founder and artistic director of Intrepid and Kristianne Kurner, co-founder, artistic director of New Village Arts Theatre more Buddy Holly fans will be are able to see this production perhaps even more than once. I would. Casting is spot on with very few changes from the south to north transfer. The live and high -energy musical score as well as some pretty authentic acting with all participating in both makes this Holly presentation a ‘Rock ‘Roll marathon. Wow what a treat. The amazingly talented Paul Swensen Eddy, who plays Buddy, and the electric guitar and sings, belts out with his group (The Crickets) and rapped out no less than 28 songs. Eddy, making his San Diego debut, already has his following after his superb performance as the bespectacled Holly. He is a force to be reckoned with. He’s a talented musician as well as knows how to put a song over. 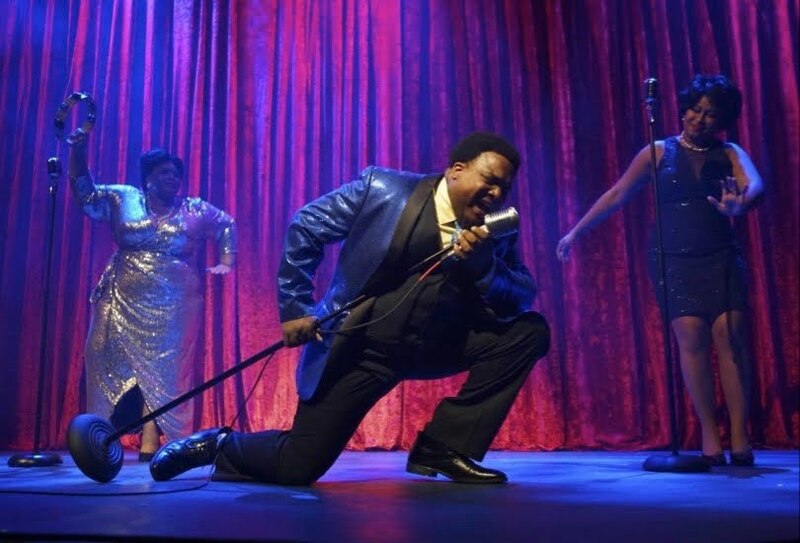 His poise and an amazing amount of energy propel this show to the top ten of the list in jukebox musicals seen not too long ago at OnStage in Chula Vista where Noah Zuniga-Williams played the lead. Then as now he’s all over that standup bass; sitting on it, standing on it and swirling it around a la showmanship. He is now the backup Buddy but also noticeably on the stage as Joe Mauldin (one of the Crickets). He is also studying tuba now at Cuyamaca Colege. Keep your eyes peeled on that one to do great things. Holly, a native of Lubbock, Texas started out as a country singer but soon switched over to rock music using his own arrangements. By the time he was sixteen he was a seasoned performer. By this time Elvis Presley came on to the scene. That had a huge impact on the bespectacled youngster from Lubbock, Texas who later became an opening act for The King of Rock ‘n Roll on three different occasions. The Holly Story precedes “Motown”, Jersey Boys and “Memphis” but seems more closely associated with Memphis (Dewey Phillips) especially in 1957 when the Crickets (boyhood friends of Holly’s) were booked into the Apollo Theatre and the owners thought they were black performers. That was a little awkward moment when three more musicians Eboni Muse as Marlena Madison, Jasmine January and jazzy Benjamin Roy as Tyrone Jones had just finished up with their gig and looked a bit flabbergasted when they saw the white musicians backstage. They tried escorting them out of the theatre, but curiosity gave way to believing. Needless to say when they heard the sounds created by Holly and the Crickets (Jerrod Alexander on drums, Ross Martin, lead guitar and Zunga-Williams upright bass and tuba) were blown away and what followed was love fest sing- along into the night. It’s difficult to single out any one of the sixteen talented performers on stage at any given moment or in the final rock ‘n roll clap-a-thon, the talent runs just that deep. Consider Wendy Maples who is a gal Friday to Eddy Yaroch’s Norman Petty. He gave Holly all the space he needed to record and ultimately became manager of the group. Back to Maples, when they needed the piano sound she sauntered over to the keyboards and began accompanying the musicians and never looked back. She is an important member of the ensemble. And who would have known that our own Eddy Yaroch (“Circle Mirror” “Wait Until Dark” and “Enron”) plays a mean Sax. Loved being a part of that. Multi talented musical director Tony Houck (“Oklahoma”, “Big River”, “Sylvia”) appears on stage as well playing accordion, keyboards and trumpet. With a cast this size hat’s off to Houk and choreographer Nadia Guevara. 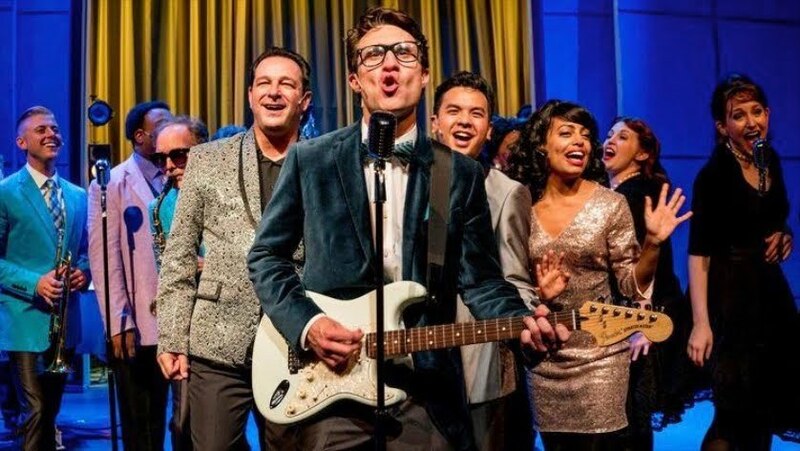 Everyone in the cast plays an instrument making this “Buddy-The Buddy Holly Story” come to life. It’s a happening and should be on your must see list if you are ready for a trip down memory lane and some great sounds! Feb. 3rd. 1959 the day of that ill -fated plane crash was also dubbed “The Day The Music Died”. Great review! Although as a proud mother, I must point out that Wendy Maples, who does a great job on keyboard from back stage, is not the Gal Friday mentioned in the review. That is my daughter, Gerilyn Brault! She plays that role along with being a back-up singer in the musical numbers.